Blue Moon Beer. Fall beverage goodness. With citrus fruit, even better. And a brewery which supports art? Holy Hey Joy jackpot, I say! 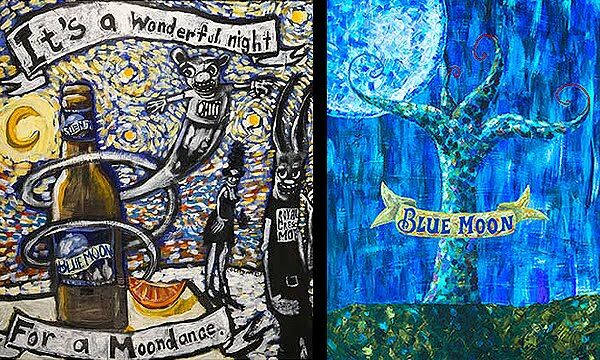 :) The Blue Moon Art Project was developed to extend the brand's passion for art beyond the brew kettle and connect with the local art communities in Philly, Chicago, Columbus, and Boston. The submissions were impressive. I encourage you to take a look. And proof if ever that these guys take this Belgian-style witbier seriously artistically. Love these lyrics. Werewolf to the hilt, Baby. Yah, I hear ya, Halloween was last week. But my blog, my rules. :) Enjoy these devilish delights. I swear, I could post a Luna tune every blog post. This one is particularly lush in the melody and lyrics: "Seven vodkas to the wind / Seven ways from sundown / Seventh heaven seventh veil / I was only joking". Sigh. This song gave me chills when I saw them this past Lollapalooza. So haunting. And so worth it standing in the rain for the performance: "And I said I know it well / That secret that we know / That we don't know how to tell / I'm in love with your honor / I'm in love with your cheeks..."
This tune made this playlist as EVERY time I hear the laugh in the background at the :30 mark, it reminds me of Count Von Count (One, muhhaah... Two, muhahhah...) which is even more fitting in light of Sesame Street's 40th Anniversary. Google did a fab job w/the custom mastheads too. Much like Luna, I've forever share YLT tunes w/you guys. Their range is just ridiculously diverse. I love the shy yet flirty context of the lyrics. And the gentle tambourine throughout. I'm forever the romantic: this is such a great love song. I know I am in the minority but, I am not a Belle + Sebastian fan (sorry Vince!). However, when Isobel is paired with Mark Lanegan (Sunday at Dirt Devil LP) it's a whole different story. Their combined talents are mezmerizing. From The Sun And The Moon LP. "Whenever I look back on the best days of my life..."
"You had a hand and it was loneliness. And all I wanted was you, oh, you..." Note the narrative that endulates in and out of this tune to the bitter end. Nice touch. I try to not post obvious tunes, but when they are just this good, I allow it. This song was released in 1993. Timeless. My jazz collection is huge. As such I want/need to start peppering my posts w/more of it. Here's a fab start. Take it away, Kenny. Ah, Frank, you old devil... Cocktails anyone? I am bending my rules here again. This tune is in this post b/c it's from the "Moon Pix" LP which aligns w/moon theme I've got goin' on here. Granted, a stretch... But it IS a killer tune and this version is the best of them all. Dripping w/angst and guitars and Chan Marshall. This song captures the essence of taking a star-lit walk on a brisk night. us new tunes and remind us of old ones. er Joyous, is there something we need to talk about? You need to add, "How Will the Wolf Survive" from Los Lobos to your wolf collection.